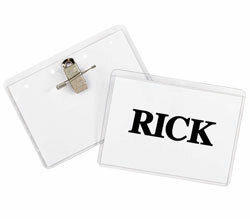 Print individual name badges using your Dymo, Seiko or Zebra Direct Thermal Printer. One Day Time's Up! Expiring Badges, reveal a highly visible color indicator the next day. Can be seen from up to 50 feet away. To activate badges simply adhere the two parts together. Don't let visitors go undetected. Peel & Stick 3 x 2 badges. 200/BX.